Interested in customizing our designs to reach potential customers? Let our design team do it for you. From brochure artwork to over-sized rendering boards for on site projects, we can take care of all of your custom needs. By adding your company name, we can incorporate your business with our designs. 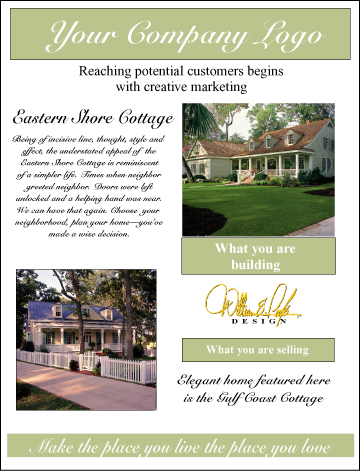 For more information on custom advertising, please contact our office at 910-251-8980. 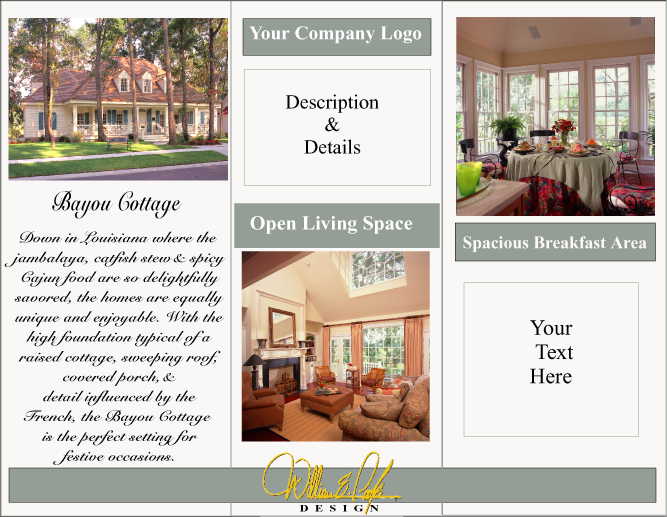 8.5" x 11" customized color print with floor plans, your customized logo and specifications. These customized color renderings portray the specification and sale copy describing each home plan. Each full color 8.5" x 11" sheet can be customized with your logo and design features. Outdoor signage (24 x 36) is laminated and can be weatherproofed for an additional fee. Great advertising for display on your construction site. Interior signage (24 x 36) is ready for mounting on foam-core backing. Perfect for open houses, sales offices and model homes. —Select a sample from the above and we'll customize it to fit your needs. Beautiful color renderings of our homes available for purchase. If ordered without the plans, they are $75 each. If you order them with the purchase of your plans, they are $10 each. Renderings can be autographed by William E. Poole upon request.